Once your dog is socialized, it makes life for you so much easier. How do you socialize a dog? It’s really very easy if you commit to doing it over a few weeks. 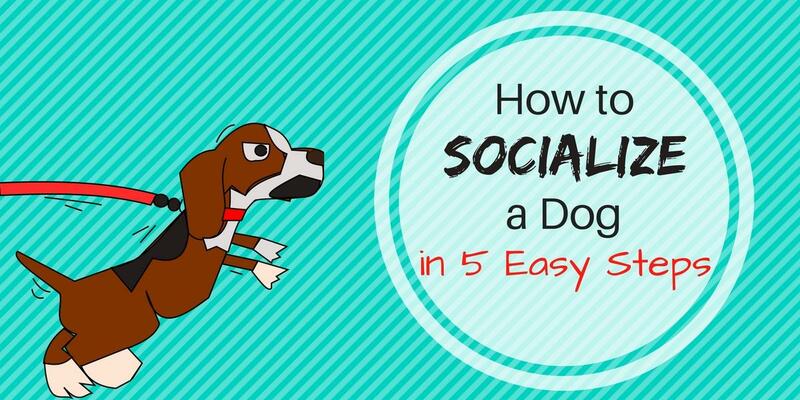 Here are 5 easy steps to find out how to socialize a dog. For the price of an extra heavy duty dog leash, you get control over your dog while they’re still learning how to socialize. I’m going to jump right into this with the 5 key points that let you learn how to socialize a dog. Just remember, even though it’s best to socialize your dog as a puppy, it’s not too late to socialize an adult or elderly dog. You will need to be patient no matter what the age of your dog. But it’s worth it. Once your dog is socialized you’ll really notice the change in your dog and the difference it will make to your lifestyle. You won’t need to feel guilty anymore about leaving your dog at home on the weekend because he can’t behave with other dogs and people. Your dog will love the opportunity to go out with you more often too. Expose your dog to other adults and children, other than those in your immediate family. Take your dog to different environments: city vs rural, noisy vs quite, crowded vs deserted. Introduce new animals, people and places in a positive manner. Do not expose your dog to an aggressive situation. Introduce your dog to another dog you know to be friendly and non-threatening. Reinforce the positive experience with treats. Start with observation, not interaction. Start slowly. Begin by sitting at the park and observing other dogs and people without interaction. Start with short visits to new places so you don’t overwhelm your dog. Extend the length of time on subsequent visits. You want to make sure that your dog is socialized because it helps him or her get used to different people, animals and situations. When a dog is socialized, they’ll be more friendly and less fearful and aggressive. When they stop being aggressive, you can take your dog more places with you. Not only does this provide more enjoyment for you and your dog but it means you dog will become even better socialized as you experience new locations together. A puppy needs to be socialized – and you can do that by having your puppy with other puppies, but ideally your puppy needs to be around other humans and children besides just those in the dog owner’s family. This teaches your dog about positive interactions. Take your puppy with you when you go out of the house. Take your dog to the park and to any stores where puppies are allowed to be inside. Get your puppy used to different environments. Your puppy needs to be exposed to quiet places and noisy places. He needs to be able to run around in a city area as well as in a rural setting with wide open spaces. By giving the puppy these new adventures, you broaden your dog’s horizon. It teaches your puppy how to act and how to interact in different settings and among different people. This is what you want. 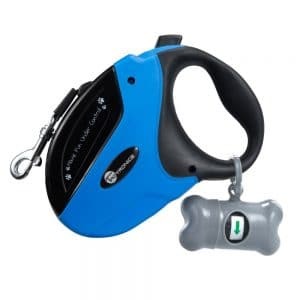 A retractable dog leash with a brake lets you keep it at the length you want when you’re out with your dog. Though puppies are the easiest to socialize, that doesn’t mean that you can’t train an adult dog. Some adult dogs aren’t properly socialized because they weren’t around other dogs or pets, weren’t around children or many other adults. This is when it’s important to learn how to socialize a dog after the puppy stage. The only situation and setting they know is their owner’s place and that limits a dog’s ability to be social. If you have an adult dog in need of socialization, you need to introduce it in a positive manner. This is much more important with an adult dog. If it’s a negative experience, the dog will be reluctant or even aggressive toward other pets and people. Should I let my dog go into a dog park? Start by slowly letting your dog get used to other people and pets. You can take him on a leash and go to the park. First of all keep your distance from other people and pets to start out with. Just take him to the outside of the area where other people are. Let him sit or stand and simply observe. Don’t do it for long periods of time. You don’t want to tire him out. Let him become familiar with a place or with a person and then slowly increase the places he goes and the people he interacts with. You shouldn’t overwhelm an adult dog with sudden new situations. Also, don’t put your dog into a situation he can’t escape from if he feels overwhelmed. By gradually expanding his world, he’ll grow used to the changes. Furthermore, always give him something to look forward to when he’s going somewhere – such as taking a treat with you and giving it to him every time you arrive at that same place. You really want to make this very positive. He’ll learn to associate the socialization event with a reward. Remember not to overwhelm a dog with new places and people too fast. Slowly increase his social circle of places, people and pets. You need to be a little patient and take it slowly over a few weeks. If you want to learn how to socialize a dog who is older, you’re probably wondering whether there’s any chance of success. Maybe you can’t teach an old dog new tricks! Senior dogs can be socialized as long as you’re supervising them. Teach your senior dog that new people and places are a good thing by praising your dog and giving treats. Take your dog out different places. Arrange visits with family or friends who have a gentle dog and let your pet meet that dog. If you know another dog that is friendly towards animals it makes a big difference and keeps the experience positive. Take it slow and give your senior dog a new social event on a regular basis. At least once or twice a week will quickly help socialize your dog. Once you get into the habit of planning a new place to visit once or twice a week, you and your dog will begin to enjoy the experience. Build up from observing to interacting and always be sure to supervise the socialization process. It doesn’t take too long for your dog to gain confidence in new surroundings and lose the fear and aggression they once had. If you like to take your dog with you out and about on the weekend, you’ll be the ultimate one benefiting from your dog being socialized. And your dog should be happier too. ☑ Are you looking for easy homemade treat recipes for your dog? See some great ideas here. ☑ Worried about your dog choking because they eat too fast? See the best slow feeder dog bowls here.